The recent AWS introduction of the Elastic File System gives you an automatic grow-and-shrink capability as an NFS mount, an exciting option that takes away the previous overhead in creating shared block file systems for EC2 instances. However it should be noted that the same auto-management of capacity is not true in the EC2 instance’s Elastic Block Store (EBS) block storage disks; sizing (and resizing) is left to the customer. With current 2015 EBS, one cannot simply increase the size of an EBS Volume as the storage becomes full; (as at June 2015) an EBS volume, once created, has fixed size. For many applications, that lack of resize function on its local EBS disks is not a problem; many server instances come into existence for a brief period, process some data and then get Terminated, so long term managment is not needed. However for a long term data store on an instance (instead of S3, which I would recommend looking closely at from a durability and pricing fit), and where I want to harness the capacity to grow (or shrink) disk for my data, then I will need to leverage some slightly more advanced disk management. And just to make life interesting, I wish to do all this while the data is live and in-use, if possible. Enter: Logical Volume Management, or LVM. It’s been around for a long, long time: LVM 2 made a debut around 2002-2003 (2.00.09 was Mar 2004) — and LVM 1 was many years before that — so it’s pretty mature now. It’s a powerful layer that sits between your raw storage block devices (as seen by the operating system), and the partitions and file systems you would normally put on them. In this post, I’ll walk through the process of getting set up with LVM on Debian in the AWS EC2 environment, and how you’d do some basic maintenance to add and remove (where possible) storage with minimal interruption. First a little prep work for a new Debian instance with LVM. As I’d like to give the instance its own ability to manage its storage, I’ll want to provision an IAM Role for EC2 Instances for this host. In the AWS console, visit IAM, Roles, and I’ll create a new Role I’ll name EC2-MyServer (or similar), and at this point I’ll skip giving it any actual privileges (later we’ll update this). As at this date, we can only associate an instance role/profile at instance launch time. Now I launch a base image Debian EC2 instance launched with this IAM Role/Profile; the root file system is an EBS Volume. I am going to put data that I’ll be managing on a separate disk from the root file system. 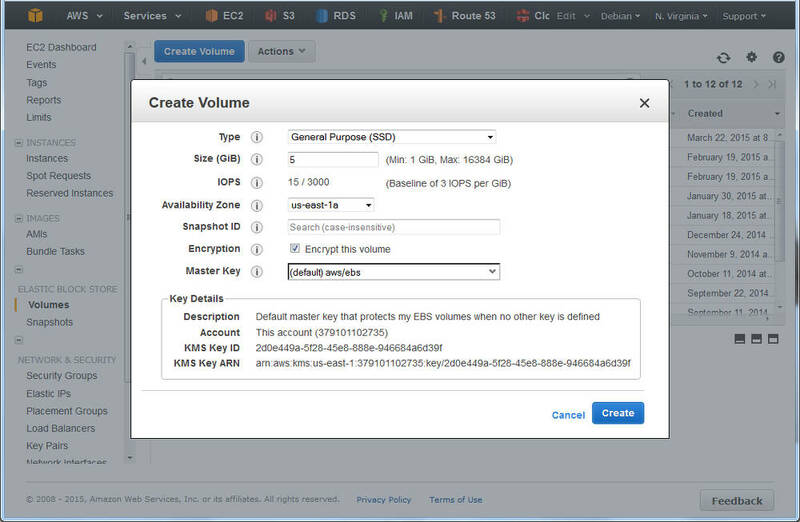 Root EBS volumes cannot currently be encrypted using Amazon’s Encrypted EBS Volumes at this point in time. If I want to also use AWS’ encryption option, it’ll have to be on a non-root disk. 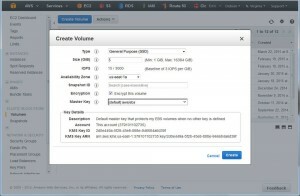 Note that instance-size restrictions also exist for EBS Encrypted Volumes. It’s possibly not worth make a snapshot of the Operating System at the same time as the user content data I am saving. The OS install (except the /etc/ folder) can almost entirely be recreated from a fresh install. so why snapshot that as well (unless that’s your strategy for preserving /etc, /home, etc). The type of EBS volume that you require may be different for different data: today (Apr 2015) there is a choice of Magnetic, General Purpose 2 (GP2) SSD, and Provisioned IO/s (PIOPS) SSD, each with different costs; and depending on our volume, we may want to select one for our root volume (operating system), and something else for our data storage. I may want to use EBS snapshots to clone the disk to another host, without the base OS bundled in with the data I am cloning. 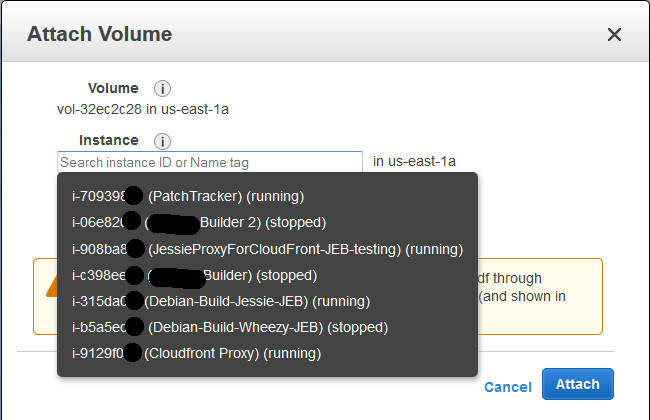 I will create this extra volume in the AWS console and present it to this host. I’ll start by using a web browser (we’ll use CLI later) with the EC2 console. 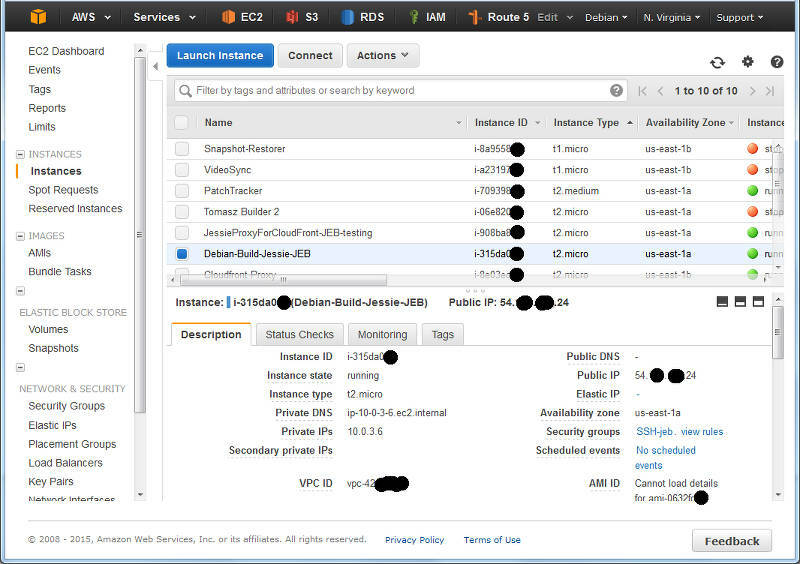 The first piece of information we need to know is where my EC2 instance is running. Specifically, the AWS Region and Availability Zone (AZ). EBS Volumes only exist within the one designated AZ. If I accidentally make the volume(s) in the wrong AZ, then I won’t be able to connect them to my instance. It’s not a huge issue, as I would just delete the volume and try again. A (redacted) list of instance from the EC2 console. The returned text is simply: “us-east-1a”. You’ll see I selected that I wanted AWS to encrypt this and as noted above, at this time that doesn’t include the t2 family. However, you have an option of using encryption with LVM – where the customer looks after the encryption key – see LUKS. What’s nice is that I can do both — have AWS Encrypted Volumes, and then use encryption on top of this, but I have to manage my own keys with LUKS, and should I lose them, then I can keep all the cyphertext! I deselected this for my example (with a t2.micro), and continue; I could see the new volume in the list as “creating”, and then shortly afterwards as “available”. Time to attach it: select the disk, and either right-click and choose “Attach“, or from the menu at the top of the list, chose “Actions” -> “Attach” (both do the same thing). Attaching a volume to an instance: you’ll be prompted for the compatible instances in the same AZ. (Note the time-stamp in square brackets will be different). Previously at this juncture you would format the entire disk with your favourite file system, mount it in the desired location, and be done. But we’re adding in LVM here – between this “raw” device, and the filesystem we are yet to make…. We can check on the EBS volume – which LVM sees as a Physical Volume – using the “pvs” command. Here we see the entire disk is currently unused. You’ll note that I have created our Logical Volume as almost the same size as the entire Volume Group (which is currently one disk) but I left some space unused: the reason for this comes down to keeping some space available for any jobs that LVM may want to use on the disk – and this will be used later when we want to move data between raw disk devices. If I wanted to use LVM for Snapshots, then I’d want to leave more space free (unallocated) again. The attribytes indicating that the Logical Volume is writeable, is allocating its data to the disk in inherit mode (ie, as the Volume Group is doing), and that it is active. At this stage you may also discover we have a device /dev/OptVG/OptLV, and this is what we’re going to format and mount. But before we do, we should review what file system we’ll use. For more details see Wikipedia comparison. Note that ZFS requires 3rd party kernel module of FUSE layer, so I’ll discount that here. BTRFS only went stable with Linux kernel 3.10, so with Debian Jessie that’s a possibility; but for tried and trusted, I’ll use ext4. The selection of ext4 also means that I’ll only be able to shrink this file system off-line (unmounted). With this in place, we can now start using this disk.Â I selected here not to update the filesystem every time I access a file or folder – updates get logged as normal but access time is just ignored. After some time, our 5 GB /opt/ disk is rather full, and we need to make it bigger, but we wish to do so without any downtime. Amazon EBS doesn’t support resizing volumes, so our strategy is to add a new larger volume, and remove the older one that no longer suits us; LVM and ext4’s online resize ability will allow us to do this transparently. For this example, we’ll decide that we want a 10 GB volume. It can be a different type of EBS volume to our original – we’re going to online-migrate all our data from one to the other. There are now 2 Physical Volumes – we have a 4.9 GB filesystem taking up space, so 10.09 GB of unallocated space in the VG. During the move, checking the Monitoring tab in the AWS EC2 Console for the two volumes should show one with a large data Read metric, and one with a large data Write metric – clearly data should be flowing off the old disk, and on to the new. EBS Optimised: a launch-time option that reserves network throughput from certain instance types back to the EBS service within the AZ. Depending on the size of the instance this is 500 MB/sec up to 4GB/sec. Note that for the c4 family of instances, EBS Optimised is on by default. Size of GP2 disk: the larger the disk, the longer it can sustain high IO throughput – but read this for details. Size and speed of PIOPs disk: if consistent high IO is required, then moving to Provisioned IO disk may be useful. Looking at the (2 weeks) history of Cloudwatch logs for the old volume will give me some idea of the duty cycle of the disk IO. Â  Removed "/dev/xvdg" from volume group "OptVG"
Wait for a few seconds, and the disk is then shown as “available“; I then chose to delete the disk in the EC2 console (and stop paying for it). Â  Size of logical volume OptVG/OptLV changed from 4.90 GiB (1255 extents) to 9.40 GiB (2407 extents). We now have 0.6GB free space on the physical volume (pvs confirms this). The filesystem on /dev/OptVG/OptLV is now 2464768 (4k) blocks long. Â Â Â Â Â Â Â Â Â  "ec2:VolumeType": "gp2"
Â Â Â Â Â Â Â Â Â  "ec2:VolumeSize": "250"
Â Â Â Â Â Â Â  "ec2:CreateTags"
Â Â Â Â Â Â Â Â Â  "ec2:ResourceTag/InstanceId": "true"
Â Â Â Â Â Â Â  "ec2:ModifyVolumeAttribute"
Â Â Â Â Â Â Â Â Â  "ec2:ResourceTag/InstanceId": "i-123456"
Of course it would be lovely if I could use a variable inside the policy condition instead of the literal string of the instance ID, but that’s not currently possible. Now with this in place, we can start to fire up the AWS CLI we spoke of. We’ll let the CLI inherit its credentials form the IAM Instance Role and the polices we just defined. …and at this stage, the above manipulation of the raw block device with LVM can begin. Likewise you can then use the CLI to detach and destroy any unwanted volumes if you are migrating off old block devices. 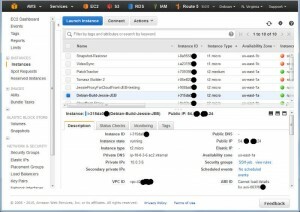 Previous Previous post: AWS API Keys: 7 Simple rules.